Chato Murciano pigs are domestic pigs from Murcia, Spain. The Spanish word chato means short-nosed which is how these short-nosed pigs from Murcia got their name. They are the only surviving breed of pig locally and historically produced in Murcia and they are at the risk of extinction. Chato Murciano pigs are generally bred for bacon and lean pork and they are well adapted to southern Spains dry and warm climate. Along with its short nose, the Chato Murciano pigs are generally black or white color and have small heads. Some tend to have white patches on parts of their body such as the tail and legs. 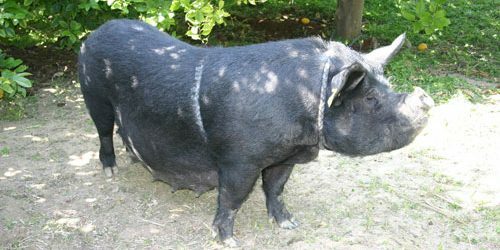 In Murcia, the Spanish were in need of an improved breed of pig as the current Murcian type was not meeting their standards. To solve this problem, they cross-bred the Murciano with the Victoria, Tamworth, the Large White and the Berkshire. There were about fifty thousand Chato Muciano pigs in 1865 and more than 100,000 in 1929. Unfortunately by the 1980s, Chato Murciano pigs were on the verge of extinction. But due to programs instigated by agriculturists and governments, the pig is gradually becoming more sustainable.